Is it me falling over, or just an effect of that lovely, eh, decor? The only picture outside is the garage? The house must really be crappy outdoors. That does not, under any circumstances, make that room look any better. That floor makes me want to hurl. Or has it already been done? It has a slightly Chucky Cheese's way about it doesn't it? It remides me of those ball pits which kids play in. Call me racist, but I don't want my daughter to marry anyone who had a room with M&M wallpaper. Nor do I want her to marry an inanimate object. M&M store displays included. 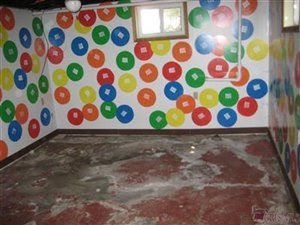 It looks like someone tore up their Twister game board and pasted the chunks on the walls! I grew up near Barberton, and this does not surprise me at all. 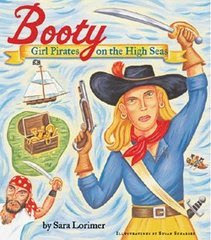 In fact, this is the height of good taste thereabouts. Going through the listings for the company, I have not yet found this house, but I did find MLS # 1529733, which is listed as a "single family home." Take a look, it's a different kind of family - a large family that has to sit in orderly rows when they watch television. i don't understand. what's the racism against M&M's. if one doesn't favor it... who cares? that anonymous person - get a life! Glad you liked this pic. I also grew up one city over from Barberton and this picture pretty much sums it up for the city. Sad huh? Oh dear. That's just horrible. I have a picture of me hugging a statue of Blue at the M&M store in Vegas but I certainly wouldn't try to use it to sell a house. Looks very twister to me. So crazy.